Free Gamer - Open Source Games: GunFu Deadlands 1.01: Performance Up! 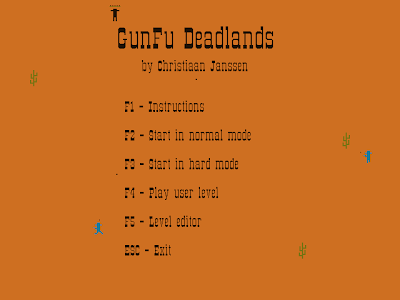 GunFu Deadlands, a quick, atmospheric retro keys+mouse top-down shooter for Win/Osx/Lin has been updated (1.01) to run with LÖVE 0.7.2 and the development codebase moved from Subversion to Git. The game plays perfectly fine on a ASUS EeePC 1000H netbook running Arch Linux 32bit. A previous version (don't remember which) was extremely slowly. I can't tell whether the playable speed is thanks to improvements of GFD, love2d or perhaps the drivers for my netbook but if you've had performance trouble with the game in the past, try again! Note: if you get shot in the title screen and start the game before respawning, you will be able to walk through walls. This is the first update of GunFu Deadlands since the 1.0 release 22 months ago. 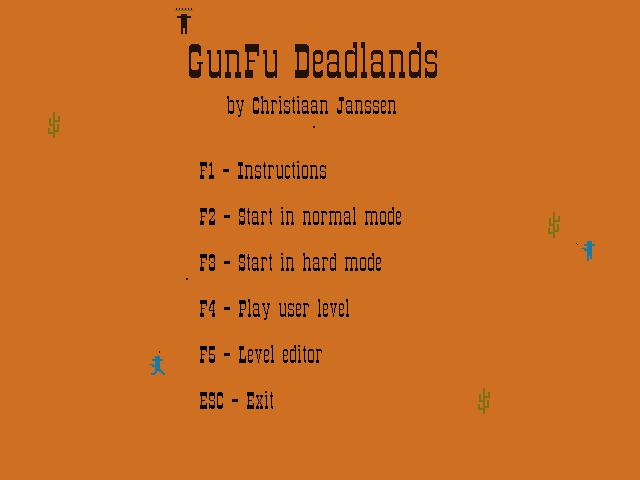 By the way, did you know that GunFu Deadlands is one of the 250 Indie Games You Must Play? Just for your interest, I made some measurements and it seems that the speed increase is indeed dramatic: 55% faster. I computed the mean FPS rate by measuring the time it takes to render 1000 frames in-game and dividing 1000 by this number. The formula (FPS_faster_version - FPS_slower_version) / FPS_slower_version is what produced this 55%.